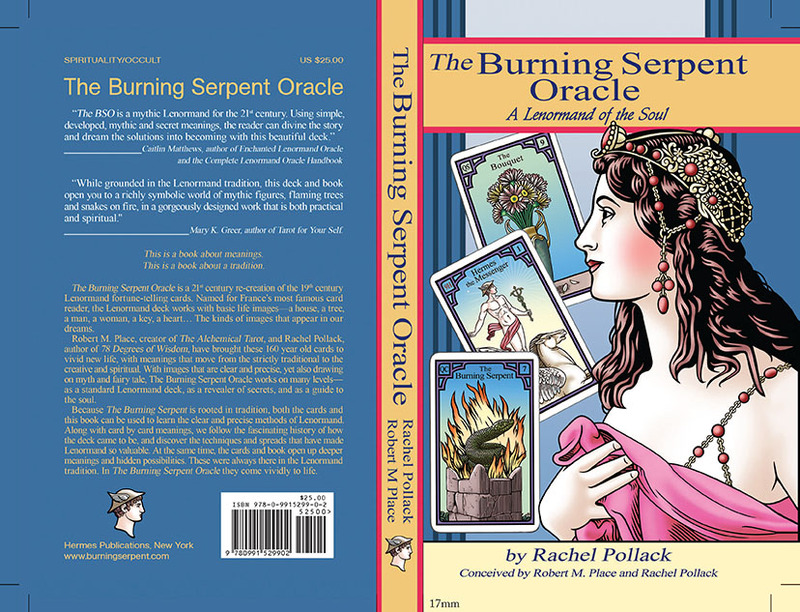 Here is the final layout for The Burning Serpent Oracle book. Rachel writes: I wanted to share this with people because the card of The Heart is one of those that I think epitomizes the layered approach I’ve tried to take in the book. And because Robert’s image is so strong and compelling. 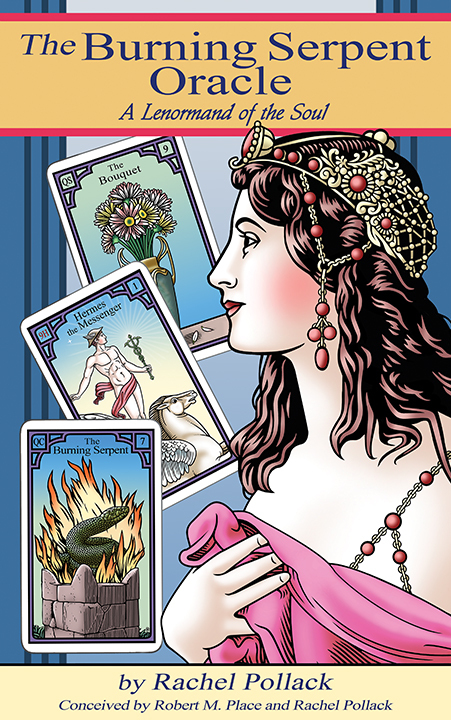 The text begins with key words for the card, drawn largely from the Lenormand tradition, followed by an exploration of what lies behind those words, including some of the ways The Heart works with other cards in combination, one of the things I love most about Lenormand reading. Then comes an exploration of meanings of the fundamental image, what a heart means in the world. 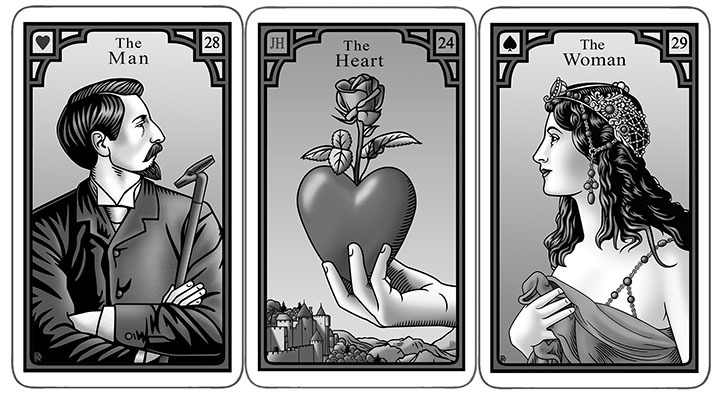 And here I had some fun, thinking of all the wonderful expressions that use the word “heart.” On a deeper level we consider that the Lenormand set of cards has a “heart” but not a “head,” and what that means. Finally, we go a step further by delving into Robert’s image, with its hints at mystical meanings. Love, heart-felt emotions. Desire, happiness. Seat of the soul, wisdom of the heart. 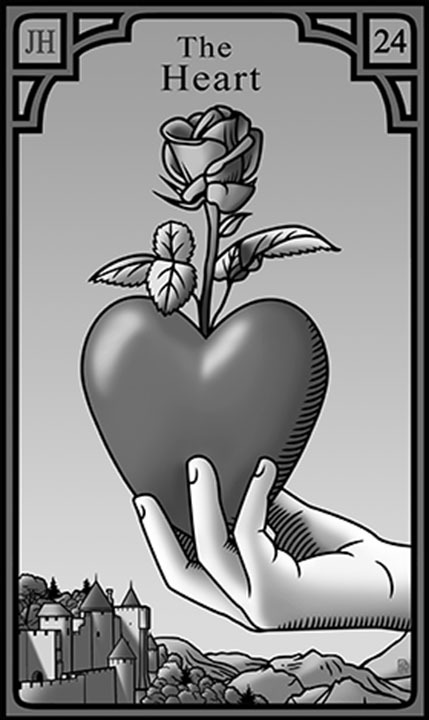 Most versions of card 24 show a traditional heart icon surrounded by flowers, most often roses. A few depict a literal heart, that is, the organ that pumps blood. Most, however, stress emotions, not physiology. Because the heart image symbolizes love—possibly the most recognized icon in modern society—the card is one of the most positive in the deck. It represents love, happiness, kindness, deep feeling. We might compare it to the Bouquet (and the flower cards in general) but with a significant difference. The Bouquet sends messages, and thus it influences the cards around it, softening the difficult ones, strengthening the happy ones. A heart is vulnerable. It takes in influences. Positive cards will likely satisfy the Heart’s desire for love and connection. Negative cards may hurt the Heart, even turn it against itself. The meaning can become envy, jealousy, and other kinds of pain we all know, when someone we love doesn’t love us back. For romantic love the strongest combination is Man, Heart, Woman, for then the two people look at each other across the offeredHeart. If they turn away from each other (Woman, Heart, Man), there may be an obstacle to love. If the Heart is closer to one of the two people, with negative cards around the other, it can signify unrequited love. Romance is the most obvious meaning for the Heart, but the card can mean any deep affection. Who has not seen the “I [heart] ___” bumper stickers? New York City began this most successful of modern advertising slogans when it was trying to overcome an image of crime and violence. With the Gold Ring we get an engagement, with the House on the Hill, and/or the Girl and Boy, we get love of family. With the Jumping Fish, love of money, with the Moon, love of honor. We humans can “heart” almost anything. In medical issues the meaning is obvious—the heart and the cardiovascular system. With good cards we can assume a healthy heart, with the Dead Tree or the Scythe, the client might get his or her heart checked. Think of all the phrases that use the word “heart.” Heart’s desire. Heart and soul. The heart of the matter. Listen to your heart. Speak from the heart. Heart of gold or heart of stone. A courageous person doesn’t lose heart (the word courage actually derives from cor, the Latin for heart). A merciful person has a heart. Our heart can be in our mouth—unless, of course, we come with heart in hand. When two people speak honestly they have a heart- to-heart. And is there anything sadder in life than a broken heart? The heart is in the center of the body (only very slightly to the left). The “heart chakra,” to use a term from spiritual anatomy, is also in the center of the body. The heart forms a border between the body’s lower functions—movement, digestion, sexuality—and the higher activities of speech, thought, and perception. Have you ever read an obituary that says the person died of “heart failure?” A nurse told me once that they put that on the death certificate when they don’t know what happened, because in fact we all die of heart failure. Your heart stops pumping and you are dead. The heart represents true feeling, true thought. “You can’t fool your heart.” It is not an accident that Lenormand contains a Heart card, but not a Brain, or even a Head. 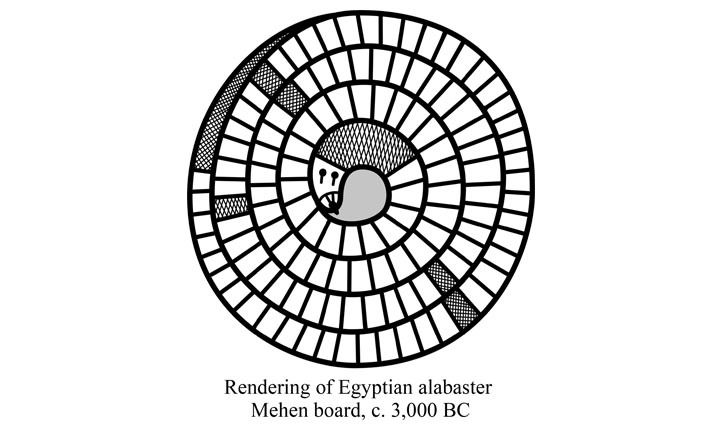 The Ancient Egyptians, and the Greeks after them, considered the heart, not the head, as the seat of thought. The Buddhists say that consciousness is in the heart, and the Sufis that it’s the place of true intelligence. The mind can be fooled but “the heart doesn’t lie.” Thus, card 24 can mean the truth of something, understood at a deep level, or despite appearances. Listen to your heart. The heart feels for others. The heart acts like a kind of opening, the place where we allow others to enter us. 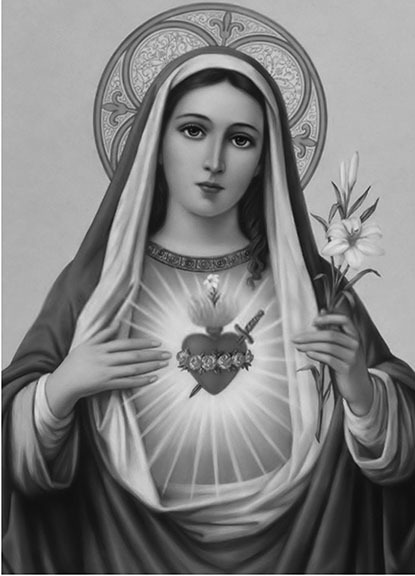 The phrase “bleeding heart,” spoken so contemptuously by those hard-hearted people who value toughness over compassion, originally referred to images of Mary, mother of Jesus, bleeding in sorrow for her son, and for all the world’s pain. 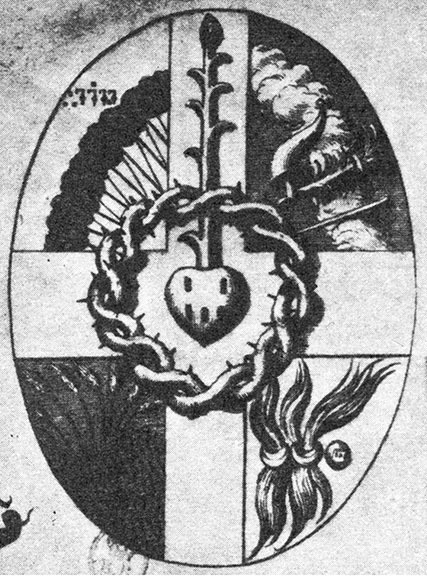 The heart icon, so immediately familiar to us, comes from the medieval cult of Mary. In the Hebrew Bible, when God instructs Moses how to build the Ark, He tells Moses not to look only at a man’s skills, but whether he has chochmat lev, wisdom of the heart. And don’t we say of a book or a movie that unless it has heart it can be beautiful but mean nothing? In the picture a hand holds out the Heart, as if to offer it, or sim- ply present it. 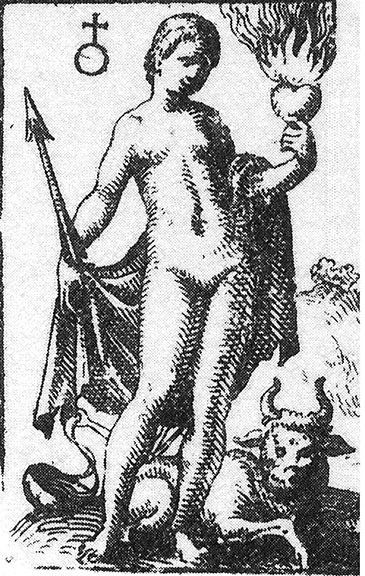 When someone approaches us with complete honesty we say he comes “heart in hand.” If the Heart appears to the right of card 1, Hermes the Messenger, where Hermes holds out the caduceus, as if they offer something to each other, then the Heart may be healed, or there may be a message of honesty and deep feeling. If the Cat-‘O-Three-Tails appears to the left of the Heart they still hold something out to each other, but now an offer of love may meet a hostile response. Another possibility—a fetishistic relationship. The Heart in its hand appears in the sky, above a medieval city in the mountains. The setting may suggest the stronghold of the knights dedicated to courtly love, a tradition that idealized love of a lady as a spiritual practice. Many of our romantic images of love and devotion come down to us from this tradition. The great Sufi poets, such as Rumi or Hafiz, speak of love in similar ways. A rose grows from the Heart. This is a Sufi image of divine love. 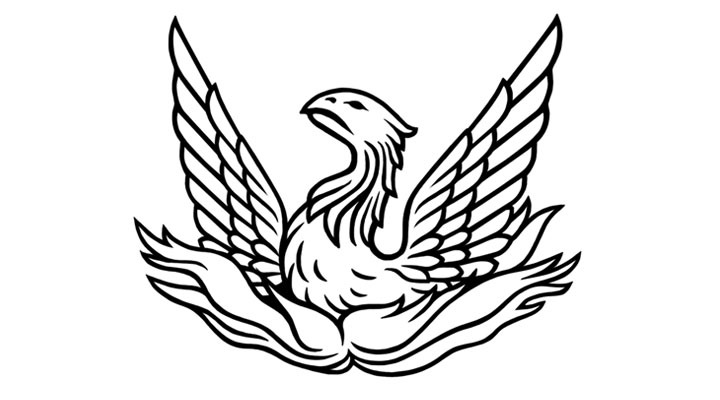 The alchemists have used it as a symbol of the Philosopher’s Stone of transformation. For Christians it represents the unconditional love of Mary. Before that, however, the rose was sacred to Aphrodite/Venus, the goddess of love and passion. When we offer our love to someone we may do so with roses. This connection be- comes emphasized with other flower cards, such as the Bouquet, or the Garden, or Lillies, but also the Key, with its rose-shaped bow, and the rose patterns in the sky. For don’t we speak of love as finding the key to someone’s heart? We do not need to build a reading around an issue card, even when that card is obvious. It can be interesting to see if such a card shows up in a short reading. 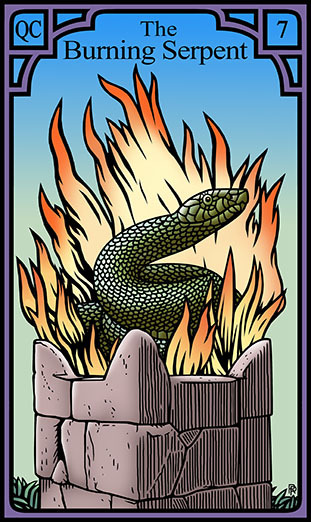 Here is an actual reading done for a woman trying to decide between two houses. Both were possible, and she and her husband had made offers on both, to keep them in play, but now they had to decide. This reading, as are any des- cribed in this book, is shone with the explicit permission of the client. Usually, with either/or choices we would do a few cards for each and compare them. This time I decided to see if a single line would give us direction. As she mixed the deck I wondered, would the House On the Hill come up? Might it take the center spot, as the Issue card? Instead, it turned up as the final card, a happy re- sult, and similar to the made-up reading above. The center card, in fact, revealed the true issue, which was where her heart was. 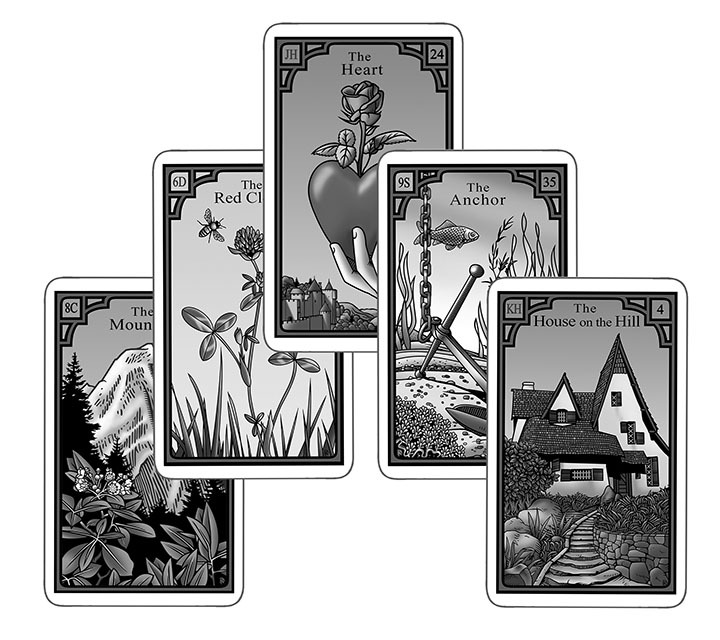 As with the imaginary clients above, take a moment to see how you would interpret these cards. The reading begins with problems. The Mountain indicates ob- stacles, difficulties in the whole process that cannot be dodged or avoided. The Anchor next to it indicates that the problems will continue for a while, and will prove hard to resolve. The ship of this great new stage of her life is not going anywhere, at least not right away. This is not surprising. Anyone who has ever bought a house will know what a long process it can be. I realize that some people reading this might say “Wait a minute—isn’t the Anchor a positive card, a symbol of hope?” The answer, of course, is yes, but the meaning of each card in a reading depends heavily on the cards around it, and in relation to the Mountain, the Anchor quality of permanence indicates that the problems continue. What we can say, however, is that the Anchor tells her not to give up hoping for a good result. The Anchor might suggest that things will take time to work out, but it also leads to the Heart, and after that her luck changes— Red Clover—and she gets the House at the end. The Heart is the center of the reading, and thus the core of the issue. Which house does she really want? Which one does she love? When I put these questions to her she smiled broadly, and it was clear she knew the answer. There is a hint that in fact the obstacles are partly the result of her making the choice harder than it needs to be. The arms of the Anchor point both left and right, and thus show her a choice. “If you want your luck to change, Anchor yourself in feelings and not the obstacles.” The hand that holds the Heart comes from the right, as if to offer the Heart to the Anchor. Some people might object that good luck, the prime meaning of the Red Clover, does not come from emotions, but simply hap- pens. And yet, many people have experienced seemingly random turns of good luck when they commit themselves emotionally to something. Also, when we find it hard to choose, and try to keep open too many alternatives, we may create more problems for ourselves. What can seem like luck might be just allowing things to move ahead. As the last card, the House On the Hill represents the happy outcome of getting the house she wants. 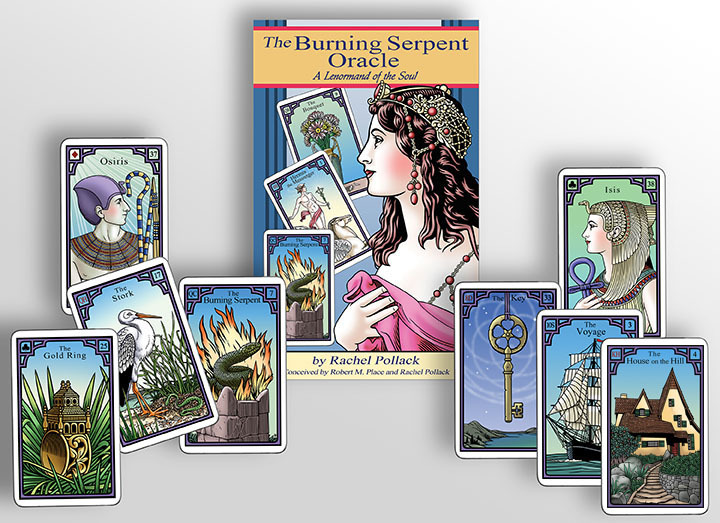 Like all cards, card 4 carries a variety of meanings, such as the self, or good health. But it also can mean an actual house, and that is the case in this reading. As noted in the fantasy reading above, this version of the House is less grand, but warmer, than older versions. I des- cribed this to the client, and the idea of it having a mysterious fairy tale quality. She grinned and said that the house she wanted, the house of her heart, had a stone pathway very much like the one in the picture. This reading illustrates the slogan at the beginning of this sec- tion of the book: The reading does not come true. It becomes true. The cards here do not reveal an inescapable chain of events. They show her a path to make something happen. 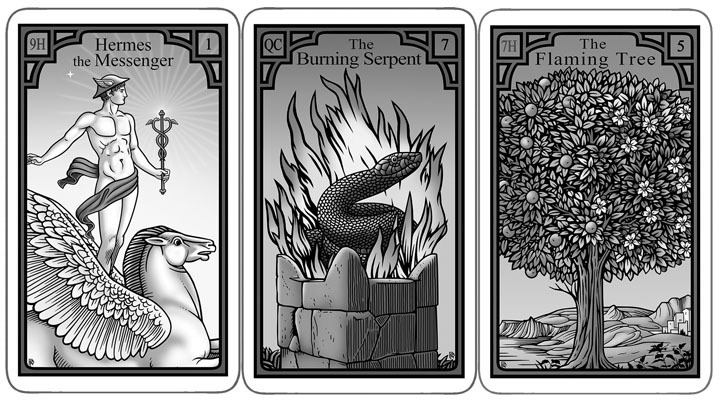 The Burning Serpent Oracle campaign is live on Indiegogo. We have actually met our initial goal, and in under 24 hours!! We are so grateful to everyone who’s joined us so far. However, this does NOT mean the campaign is over. Far from it. 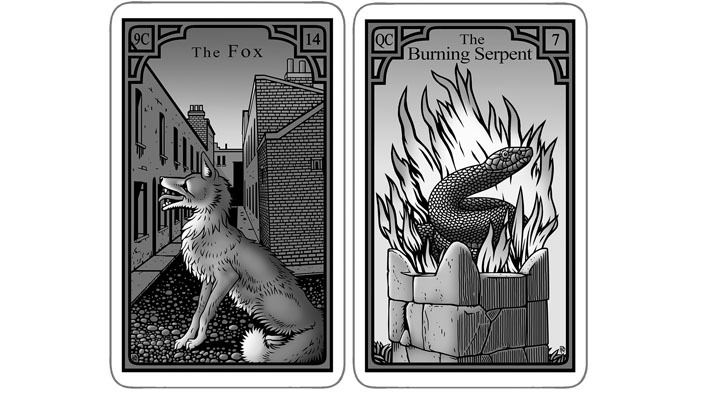 We are continuing to our final day of April 24, to make sure that everyone who wants this deck and book can pre-order their copy, so that as soon as it arrives we can send it out to them. And the extras continue! We also plan to add some new ones, so check back.